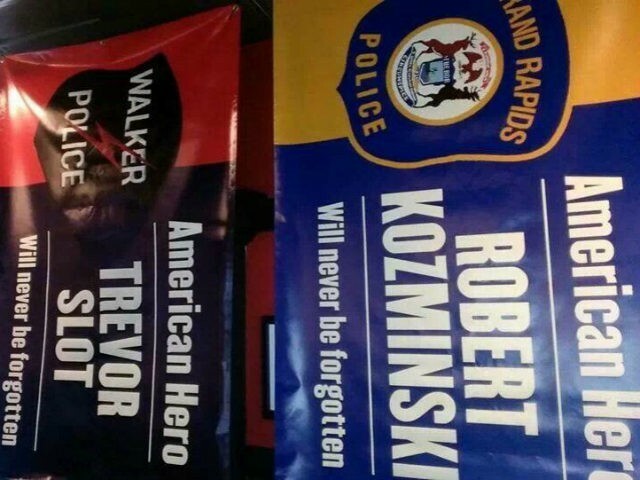 A restaurant owner in Michigan says he will refuse demands by city officials to remove flags hanging outside his establishment honoring police and soldiers who have fallen in the line of duty. Brann’s Steakhouse owner, Johnny Brann, said the city of Grand Rapids sent him a letter demanding the removal of the flags for supposedly violating zoning ordinances, Fox News reported. “I think I exceed the allotted amount for signage,” Brann told ABC Channel 13. The business owner said he had filed a request for a variance on the zoning rules with the City of Grand Rapids Zoning Appeals Board, but he went on to insist he was keeping the flags no matter what the city decides. Brann created a GoFundMe page to help him raise the $1,349 cost of the variance filing. “Mr. Brann is standing up for his beliefs, and is showing unbelievable respect for Police Officers, and fallen heroes,” the GoFundMe page reads. Appearing on a recent Fox & Friends, Brann noted that 22 police officers have been killed in the line of duty this year, adding that he thinks it is important to recognize their sacrifice. “Law enforcement and our military are vital. So it’s not even complicated to me, and the banners and the signs are staying up,” Brann added.